New Singapore Budget, New REIT Strategy! 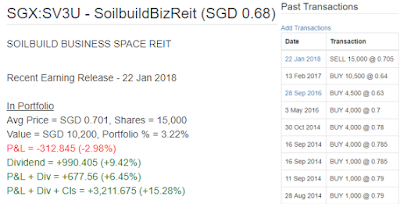 Apart from the increase in GST and the government ang bao (red packet), one thing that really interest us is the extended tax transparency treatment of Singapore listed REITs (Real Estate Investment Trusts) to ETFs (Exchange Traded Funds) - Singapore Budget 2018: Reit ETFs to enjoy tax transparency. In short, this means that the REITs ETFs will no longer have to pay the 17% tax and the dividend yield will increase significantly! I blogged about 3rd REIT ETF - Lion-Phillip S-REIT ETF previously and how we will give it a miss because of the tax and its impact on the estimated yield. As usual, I took some time off and played with the numbers. 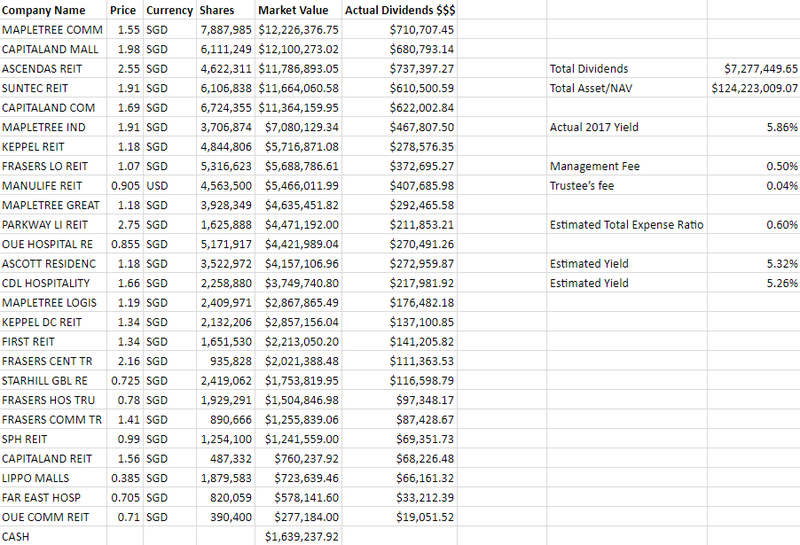 Interestingly, the holdings are slightly different as compared to its IPO. You can look at the google spreadsheet here if the picture is too small. The indicative holdings (as of 23rd Feb 2018) are obtained from the Lion Global Lion-Phillip S-REIT ETF website. The estimated (using 2017 full year dividends) yield is around the same at 5.86%. Assuming that the total expense ratio for a year is around 0.6%, the dividend yield would be 5.26% if one were to purchase the ETF at its NAV of $0.999. At the point of calculation, the ETF closed at $1.015 with a CD status and will XD on 2nd Mar 2018 with $0.0168 dividend. $0.999 + $0.0168 ~ $1.0158. Do note that this is only an estimation and the dividend yield will definitely be lower for this year because the tax transparency will only take effect on/after 1st July 2018. Having said that, we would be expecting at least 5% dividend yield in FY 2019 onwards which brings me to our new strategy! 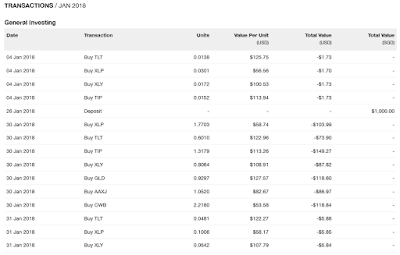 As some of the readers may know, we have a mutual/common fund called KPO Fund (surprise, surprise) where we were contributing $1,000 each every month. You can read more about it here - Managing Finances As A Couple. The fund is divided into "Expenses" and "Investments" where we put $1,000 into each monthly. With the promotion and pay bump (Salary - You Are Your Best Investment), we have decided to increase our contribution to $1,500 each every month. However, we agreed that our expenses should not increase hence the monthly contribution has become $1,000 to "Expenses" and $2,000 to "Investments". 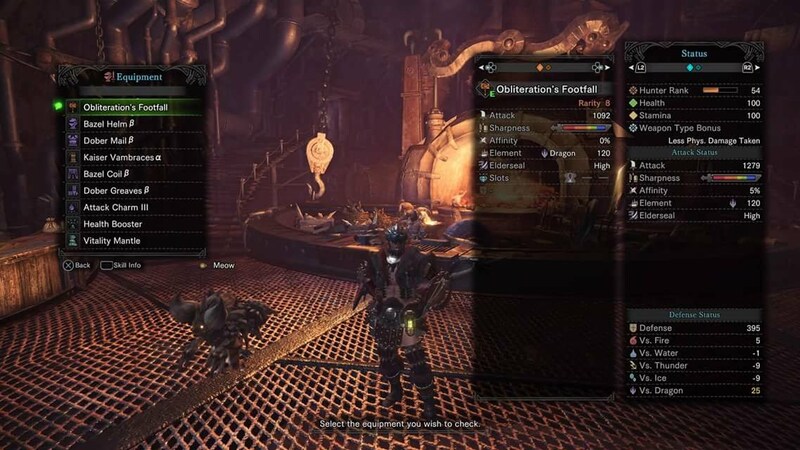 I am sharing something different today - my Hammer build/equipment in Monster Hunter World! 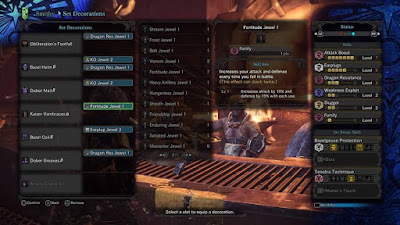 This mixed armor build gives max Attack Boost (Level 7), max Earplugs (Level 5) and max Weakness Exploit (Level 3)! It comes with lots of slots for decorations/jewels too! All these are before augmentations. 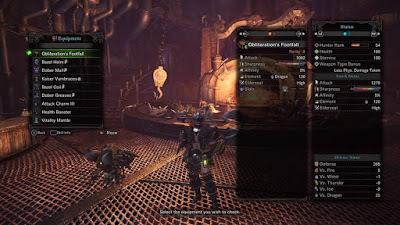 In my opinion, these 3 skills are necessary for a hammer player because we go for the highest damage output! Max earplugs ensure that we will not be affected by the monster's roar and give us the opportunity to continue whacking. One can argue that rolling out of the roar works but we will lose the charge as a result. Alternatively, one can also change the head, glove, and charm to give a similar build. Red Red Market for Chinese New Year! Let KPO start by wishing all my readers a Happy and Healthy Chinese New Year! 恭喜发财，身体健康！Huat ah! It has been 2 weeks since I last blogged! CZM (being one of my readers) reminded me that it has been a long time! What have I been doing for the past few weeks? Busy playing Monster Hunter World! Hahahaha. I am currently at HR (Hunter Rank) 52 and have clocked > 80 hours of gameplay till date. Shall stop here, CZM is already complaining she has lost her bf. The last 2 weeks, all the markets were in red and I received FB messages and emails asking what to do, etc. My reply to them is the same, we are not doing anything and there will definitely be volatility in the markets. Technically, we did something, we bought 1,000 units of STI ETF @ $3.40 and was queuing for Singtel last week but did not get it. We are using money which we do not need in the near future to invest and we are prepared even if the market crashes and our portfolio drops 50%. 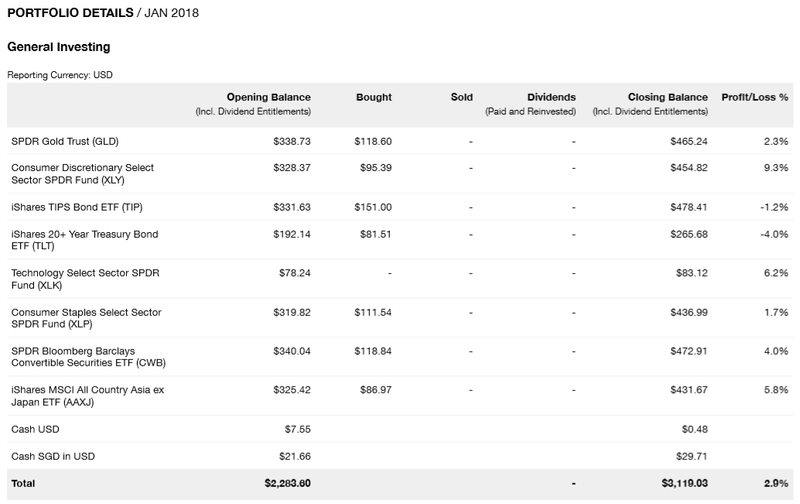 The last 3 weeks, we have seen our portfolio decreased by $17,158.59 but life goes on :) Numbers are relative right, what is our loss compared to theirs - These 10 Billionaires Lost $40 Billion This Week As Stocks Plunged. One can argue that protecting the capital is important, a drop of 50% would require a 100% gain to break even, etc. Honestly, who knows what is going to happen? There are studies that show missing out one of the good days can be just as painful - Cost of Missing 10 Best Days. At the end of the day, there are really no right/wrong/best financial decisions. Make one and live with it. We are investing for dividends, hence we are not too concern with the ups and downs of the market. My dad recently received the "Retirement" letter from CPF informing him that he can withdraw his CPF money soon. If you are interested, you can find it here - CPF Retirement Booklet. As usual, he would ask me to explain what is happening and I told him that the government is giving him money, $5,000.65 to be exact. He was pretty happy and was saying that our government is good. To put it into context, my dad has been working in Malaysia for many years and is currently a taxi driver. As a result, he does not have much in his CPF, ~$6k+. He is probably one of the rare ones that can get close to 100% out! Today, the government announced that the GST will be increased to 9%, he said government not good. lol. I have not been following it closely but came across the condensed version by Seedly which I thought is pretty neat - Seedly Singapore Budget 2018. Danger danger! New readers/investors, please do not follow or read further! As you might be aware, we are pretty aggressive in building wealth and we do not really have an emergency fund or a "war chest". We are exploring the possibility of using leverage to 1. further build wealth and 2. serve as our "war chest". People investing in properties and companies raising debts are all forms of using debts to grow wealth/assets. So what is stopping us from doing the same? We are looking at Standard Chartered Secured Wealth Lending specifically since our investment is with them. We were quoted a fixed rate of 1.6% + 1-month SIBOR (which has been increasing!). I guess this can be a separate post itself. 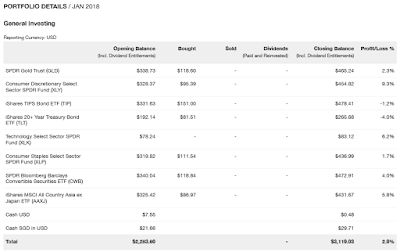 We have decided to invest more money (from $500 to $1,000 monthly) through StashAway and I blogged about it here - Automating Capital Growth Through StashAway. 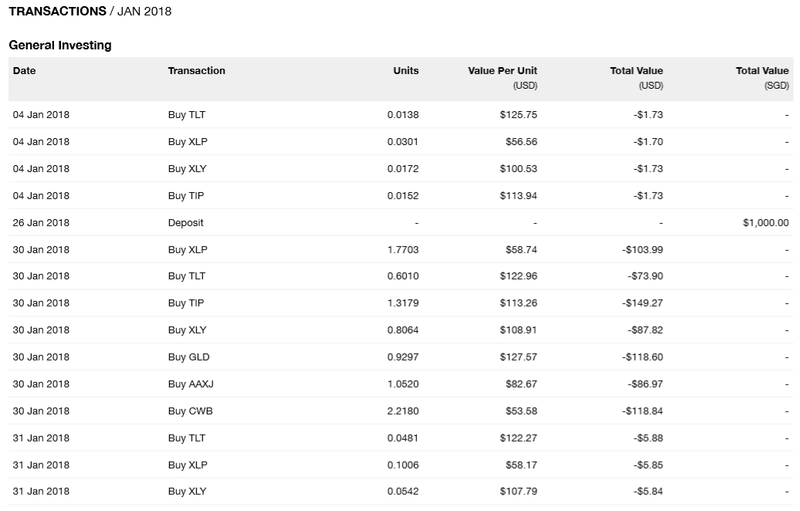 Based on the statement (30 Jan 2018), we had $90.46 profit after taking into account a -$56.00 currency impact. The profit has vanished in the last few days to $13.00 but we are not too concern. Short-term volatility is noise while long-term will be $$$. That is how the market works. I am still going to complain about the amount of USD we are getting from our SGD deposit and the exchange rate. Technically, this can be easily computed from the USD cash flows and once the USD amount is obtained, the exchange rate will be revealed. Not too bad. Managed to get some USD at its low. 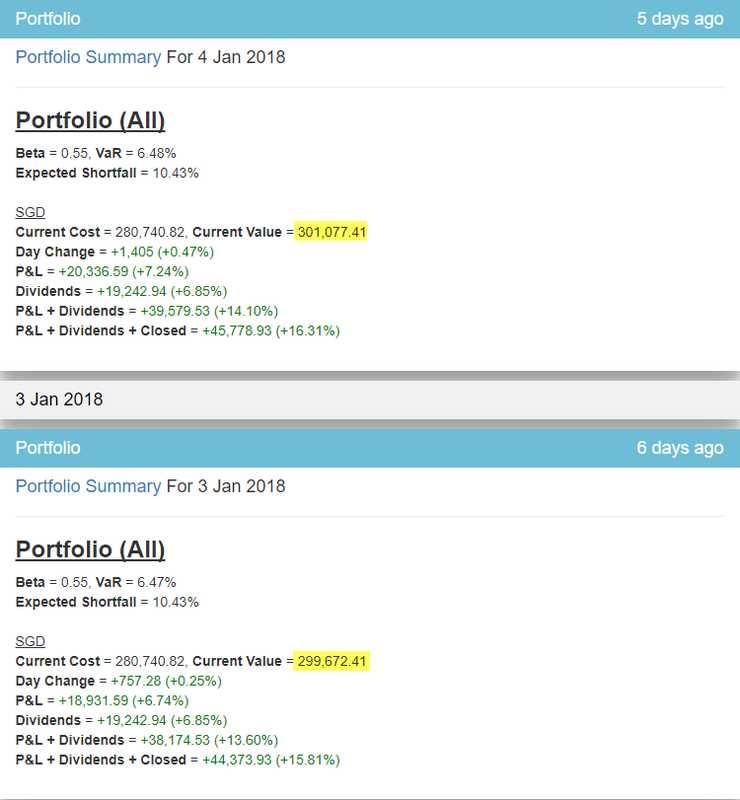 Since there is no way to compare the performances among the robo-advisors, I came out with a spreadsheet to track our StashAway portfolio performance (General Investing - Risk Level 28) against that of STI ETF which I will be updating on a monthly basis. 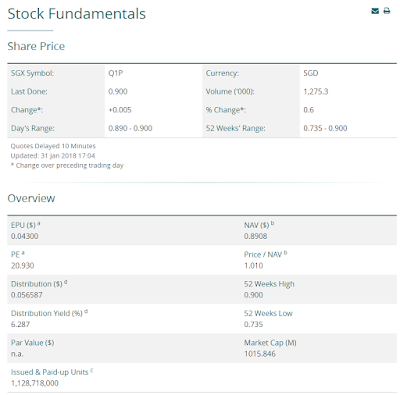 For simplicity, I shall assume that one can either invest in Nikko STI ETF using POSB Invest-Saver or invest in SPDR STI ETF using SCB Priority Online Trading (no minimum commission). These would be the opportunity costs while we continue to invest in StashAway. 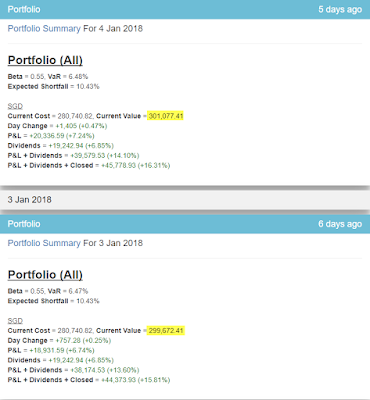 Our portfolio increase by 7.24% to $317,607 - $11,017.22 of capital injection and $10,431.30 of capital growth. 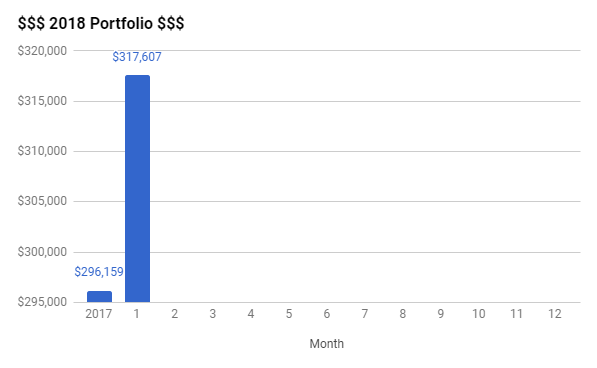 The year started with a BANG and within the first week, our portfolio crossed the next 100k milestone to $300,000. 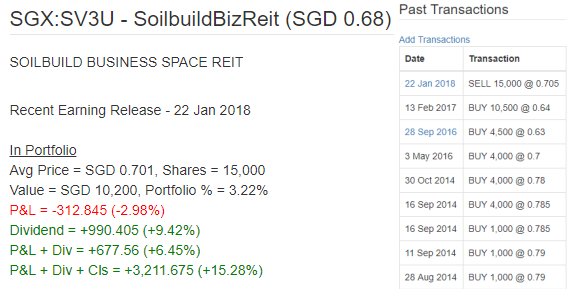 Soilbuild Business Space REIT was one of our biggest holdings with 30,000 units. It has been hit with a series of unfortunate events, one after another. Apart from the 2 defaults, the latest bad news is that their property has been revalued down. 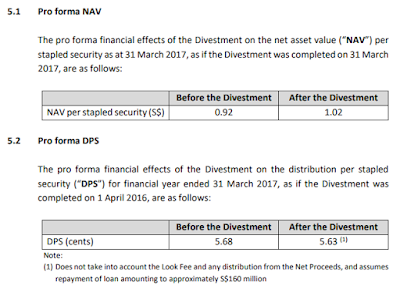 Based on the latest 4QFY17 results, NAV decreases from $0.72 to $0.64 which meant that it is trading at a premium. DPU decreases by 6.2% YoY even though NPI increases. We are no longer willing to take the risk of capital loss, lower DPU, and uncertainties. Hence, we decided to sell half of it. Selling it before XD means giving up $0.01383 of dividends but we are expecting the price to drop below $0.69 after XD and it sure did. I have blogged about ThaiBev and Ascendas H-Trust separately. Do refer to those articles for more information. We purchased Geo Energy October last year and decided to buy more for the same reason. We bought Wilmar because it is one of the stock that did not/yet to run up in the bullish market, it is currently trading at PE ~10-11+ which is significantly lower than the others (e.g. Olam). We believe that there is definitely room for capital gain while waiting patiently and collecting ~2% of dividends. USD has been falling significantly which resulted in the high negative currency impact. 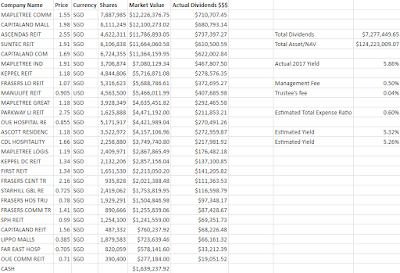 Overall absolute return is now lower than STI ETF based on our spreadsheet - KPO & CZM StashAway Portfolio VS STI ETF. Do take a look at this article if you missed it - StashAway Clarifications - Reward-to-Risk Ratio where Freddy Lim (Co-Founder & Chief Investment Officer of StashAway) clarify how StashAway is optimizing return by taking on lesser risk. Let me give a quick introduction to Ascendas Hospitality Trust. It has 11 9 properties in 7 6 cities, 4 3 countries (Australia, China, Japan and Singapore) valued at $1.6 Billion. Based on the last quarter financial statement, its current NAV is was at $0.891 which translate to a PB of 1.01. However, on the 29th January 2018 (after market close), Ascendas Hospitality Trust announced that it will be divesting its China investment/properties at a premium of 101.5% above the Independent Valuation. You read that right. This divestment meant that its NAV would shoot up. 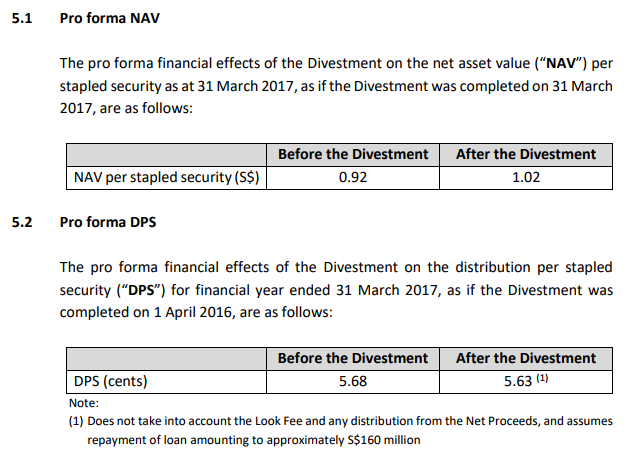 Note that the numbers are generated with the assumption that the divestment has taken place at 31st March 2017. The total number of shares/stapled security would have increased since then. Using the latest (2Q) financial statement, a more realistic NAV should be [1.02 - (0.92 - 0.891)] * 1,124,481 / 1,127,553 ~ $0.988 which translate to a PB of 0.905 (at a discount)! I am expecting it to trade closer to PB of 1 which is around $0.99. 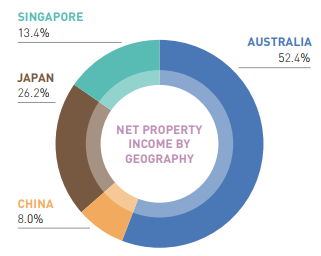 Looking at the annual report FY2016/2017, China contributed 8% of the Net Property Income (NPI). A conservative assumption is that the DPU (Dividend Per Unit) will be impacted by the same percentage, 5.68 * 0.92 ~ 5.22 which translate to a 5.8% dividend yield. This is on the low side but it certainly has room for improvement through yield accretive acquisitions because it has the cash/lower gearing going forward (~20+%). I made all these calculations while I was on a bus traveling to work yesterday and decided to queue for it before market open. 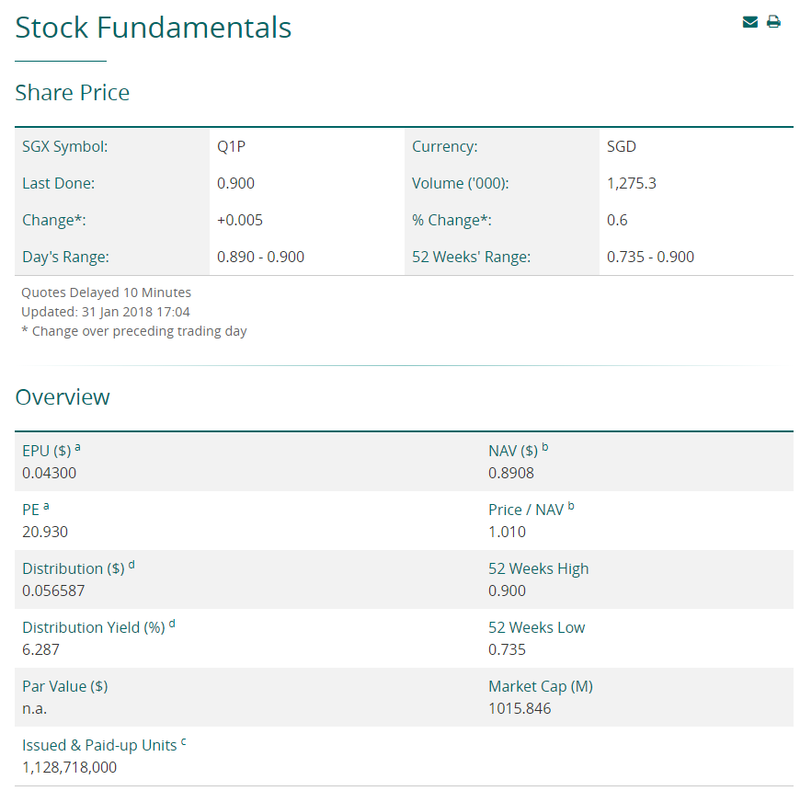 Blogging it down to see how wrong/right I am as its 3Q financial statement will be out today after trading hours. 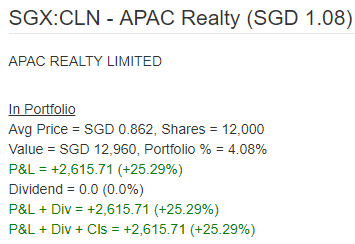 On a side note, APAC Realty went up by 9% crazily (no announcement) yesterday to close at $1.08. At least I am right for this analysis and am sitting on a 25% profit (for now)!